Every once in a while, Sam would take a walk to the cliff. There, he would sit on the edge and dangle his feet 15 metres above the surface of the sea, and listen to the waves splashing against the rock. He would also bring a sacrifice. In his teenage years, Sam had visited the cliff, and others like it, frequently in person and in dreams. Always, when he had been around high places, he'd felt the gravitational pull of whatever lay below, especially if it was water. It felt like a call of freedom. 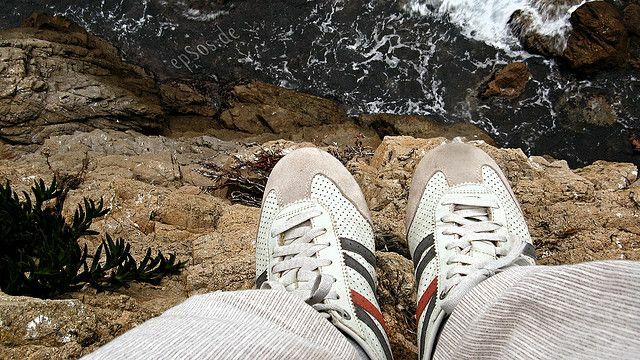 In bad times, and there had been a lot of those, the boy had sat at the edge of the cliff and thought about falling. Falling, in his mind, was like flying, if only for a very short time - flying to freedom. He had never taken the plunge, though. Once, he had called himself a coward, and other - worse - things because he couldn't make his body fall even though he wanted it to. He'd gone home feeling worthless, disgusted by his own cowardice. Two days later, the girl who sat next to him in biology class had asked him out, and a happy two months followed. Then he was back at the cliff, but he never could go beyond the edge. Sam grew up and forgot about the cliff for some time. He was free by himself now, free from schoolmates he didn't like, classes he wasn't interested in, and the restrictions of youth. At first he didn't even notice that the dreams of falling had stopped, or that his walks took him elsewhere now - until a girl took him there for a date. It had never gone farther than that horrible first date, on which the cliff and the fall had come back into his life and had brought fear - the fear of his own past dreams - with them. It had taken the young man some months to get over the shock, and to understand what he had to understand, what he had known all along and what had always kept him from actually falling: that there was always, and would always be, something worth living for. The true freedom lay in having a choice, a chance to choose life and change what kept the feeling of freedom away. Once you've grown up, you can choose your cage and make it your home, until it is not a cage at all, but a place of freedom all in itself. That is why, every once in a while, Sam would go back to the cliff and give a sacrifice to the false call of freedom that comes from the sea, from the fall - as a reminder that he didn't need it any more. This time, it was a gerbera.